The Bad River Band of Lake Superior Chippewa Indians has denied the renewal of Enbridge's Line 5 pipeline lease through their reservation. The 64-year old-pipeline used to be called the Lakehead Pipeline. 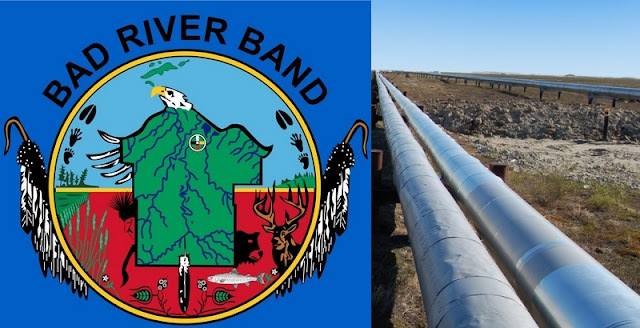 The tribal council says it is also calling for the decommissioning, and environmentally safe removal of the pipeline from all Bad River lands and watershed. The tribal chairman says even a minor spill could prove disastrous for the 7,000 Bad River tribal members. The Bad River Reservation covers 124,000 acres within Ashland and Iron Counties. Enbridge spokespeople say Line 5 is a vital link to propane energy supplies needed throughout the Midwest, including northern Wisconsin. They add that it transports up to 540,000 barrels per day of light crude oil, light synthetic crude oil and natural gas liquids - which are refined into propane. The Bad River Lapointe Band of the Lake Superior Tribe of Chippewa Indians are a federally recognized tribe of Ojibwe people. The Bad River Reservation is located on the south shore of Lake Superior and has a land area of 156,000 acres in northern Wisconsin straddling Ashland and Iron counties. The tribe has approximately 7,000 members, of whom about 1,800 lived on the reservation during the 2000 census. Most people live in one of four communities: Odanah, Diaperville (also called Old Odanah), Birch Hill, or Frank's Field/Aspen Estates. Odanah, the administrative and cultural center, is located five miles (8.0 km) east of the town of Ashland on U.S. Highway 2. New Odanah is also located on the reservation. Over 90% of the reservation is undeveloped land. Responses to "Chippewa Tribe Denies Enbridge's Pipeline Lease, Calls For Its Removal"
Thank you for taking care of our earth! Good for them! Take back your land. The Gov can no longer run over you with impunity. Right... have any of you ever driven through a reservation? They can't even take care of that. They certainly aren't taking car of the Earth. That pipeline has been there for 64 years.... and never a problem. 64 years! This is just dome out of spite. I hope they can't get out of that lease. gee, i wonder what kind of 'fuel' the natives use. could it be propane as most residents of the north central country uses!? Isn't that like cutting off your 'nose' to spite your face? I'm sure than not all are using wood burning stoves for heating their house.......that would be 'work'.! 64 years you ding dong is wayyyyy past the life of the pipes themselves and asking for a disaster! It's their land, their right. Are we REALLY going to try and tell First Nations people what they can do with their land, kind of think we have done that the last 5 centuries. I'm growing increasingly concerned for our nation and our world. Wherever we turn, there is conflict, hatred, war, oppression, hunger, bitterness. Truly the last days prophesied in scripture are upon us. And people will continue to refuse to see. You are so smart to want this aging pipeline off your land. This is your decision and nobody else's. Best wishes to the Bad River Band. Their land. I hope their decisions are based on the best for their people, but whether it is or not, it is their land. How many times have the Indians lost to the white man.This is their land by our treaty. they have a right to have it removed. What did they receive for having this on their land,a few beads and trinkets from corporations. I am so happy to hear of this Chippewa Tribe taking a stand against another greedy energy company to help protect their land and, in turn, protecting the land and water for all people in our nation. Their land good for standing up. Eminent domain applies on Indian land?